I lost my voice for a year in 2000. During that time, I took yoga (Asana) classes. Yoga relaxed my neck muscles. With couple of surgeries on my vocal folds and yoga practice, I regained my voice gradually. Now I am able to sing in concerts and do public speaking nationally. I am grateful to yoga for helping me reach to this point. I strive to follow Patanjali’s Yoga Sutras in which Asanas are one part. On the mat, Asanas help me understand myself more. Presence of mind, concentration, acceptance, striving to do better, breathing consciously, listening attentively, empathy and discipline are few things that I learn from Asana practice. I strive to implement these in my in my professional and personal life. My practice on the mat reflects my state of mind and body. On the mat, as I accept and love myself in spite of my limitations, off the mat I accept and love others. I have been practicing Asanas at Lila/ Yoga Exchange for the past 7 years. I love Lila and its community. I like not only practicing Asanas, at Lila but also spiritual way that the teachers teach. I find Lila community gentle, friendly, spiritual and committed. After my home and office, I spend most of time at Lila. 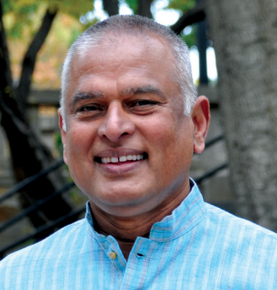 You can also check out Ashok’s article, published in Portland Magazine!